George's 2011 trip to New York City. 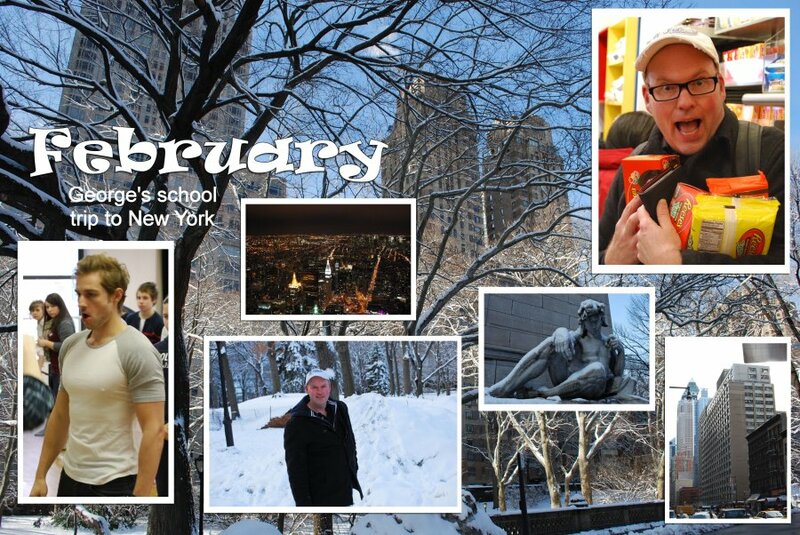 In February, 2011, George took a school group to New York, where snow and Reece's products were found in abundance. The man in the tight t-shirt was our stage combat instructor. My apartment from the 80s is shown above. We did workshops with Broadway stars, rode across the Brooklyn Bridge in stretch limousines, visited the Met, bought cupcakes at Magnolia Bakery, and saw the amazing Fuerza Bruta (but sadly not on Boys' Night). 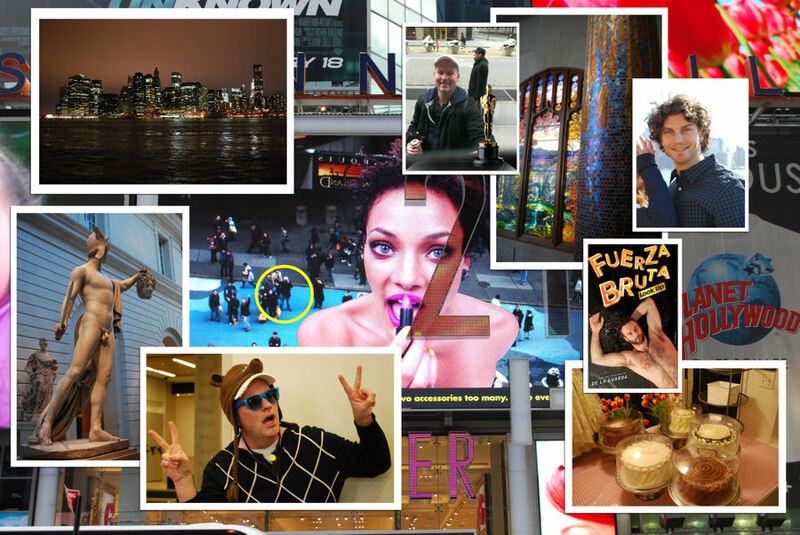 The large photo above is a clever ad in Times Square that juxtaposes video with live shots from the street below (that's me in the yellow circle). Top right is A.J. our cute tour guide. 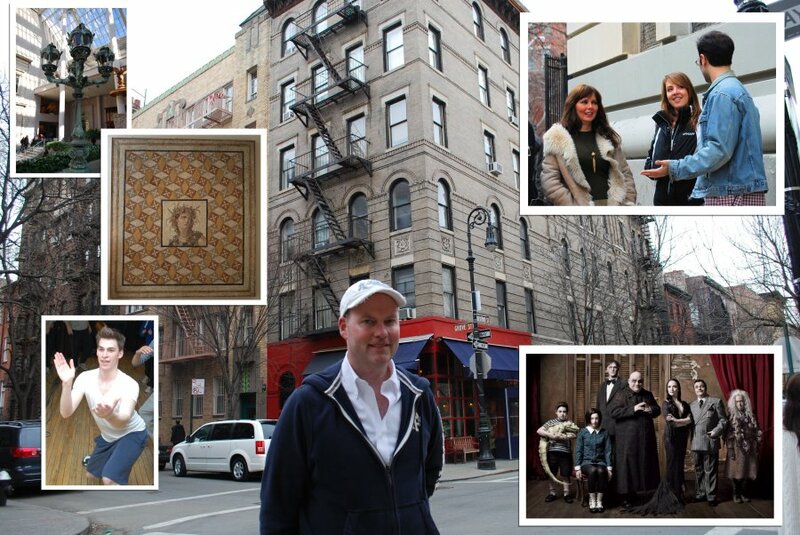 A movie locations tour took us to the Friends apartment in the Village. On our tour, we bumped into British celebrity Carol Vorderman, whose own tour guide didn't realise she was famous. Our guide secretly sent him a Google link to alert him to her identity. Other photos here are from the Met, our dance class ingenue, and The Addams Family musical, whose star, Krysta Rodriguez, talked to our group. Click HERE and HERE to see past school trips to the Big Apple.